to be just a tease. It's a lot easier to kill jobs than to create them. It is much easier to kill innovation than to create it. Trump's Department of Energy, led by former Texas governor Rick Perry, seems to be taking the easy route. As reported in the journal Science this week (and first reported by Politico Pro), DOE has halted its process to award $70 million in new grants that its research agency, ARPA-E, had announced this past December. ARPA-E is the Energy Department's Advanced Research Projects Agency, created to fund high-risk, high-reward new ideas about energy. "The resulting uncertainty is having a devastating impact on research teams, scientists say, and even threatens the viability of small companies for whom these major awards are so important." "As with any transition from administration to administration, we have undertaken a full review of all department programs, policies and taxpayer-funded grants." I'm sure that makes the unemployed scientists and struggling energy technology companies feel much better. Cutting funding that has already been awarded–and which used money that was already appropriated by Congress–is especially disruptive. How can anyone hire new scientific staff when the federal agency might yank away a grant that it had already announced? The Science story described a young Ph.D. plant biologist from Penn State, Molly Hanlon, who was due to start work next week on one of the new ARPA-e projects, but now she might not have any job at all. 15 of the 26 projects are led by companies, most of them small companies trying to creative innovative new technologies. The other 11 are housed at universities, including Energy Sec. Rick Perry's alma mater, Texas A&M (so at least we can't blame Perry for bias). And 9 of these 19 states voted for Trump last November. This isn't even the whole story. Eight more projects under a different ARPA-E program, ENLITENED, were told in mid-March that they would be funded, Science reports. Just a week later, though, the press conference to announce the awards was cancelled, and the program now appears to be in danger of cancellation. I'm sure that all of these project teams invested many months in preparing their winning proposals. Leaders of the projects announced back in December were poised to begin their research until the sudden announcement this week, with no explanation, that everything was on hold. All that Mr. Trump has to do to save these valuable, high-tech jobs is nothing; just let the DOE's ARPA-E program do its work. Unfortunately, this seems to be too much to ask. will do, Bayer or otherwise. Should you take an aspirin every day to prevent some types of cancer? The evidence is growing, and it all points to the same answer: yes. In 2016, the US Preventive Services Task Force, a science-guided panel that reviews the evidence for a wide range of treatments, recommended regular low-dose aspirin use for people between the ages of 50 and 69 as a way to prevent heart attacks, strokes, and some types of cancer. For people younger than 50 or older than 69, the USPSTF said that the evidence was inconclusive. Later in 2016, a study by Yin Cao and colleagues at Harvard found that aspirin use reduced the risk of cancers, especially colon cancer. To be specific, they found a benefit from taking 0.5 to 1.5 aspirin tablets per week for at least 6 years (a standard tablet is 325 mg). For people who followed this regimen, the risk of colon cancer was about 19% lower. Now, a new study also led by Yin Cao and others at Harvard, just reported in the annual meeting of the American Association for Cancer Research, shows even clearer benefit. They looked at long-term results in a group of 130,000 women (mostly nurses) and men (doctors and other health professionals) who have been followed since the 1980s. Overall, woman had a 7% reduction in the relative risk of dying from any cause and men had a 11% reduction. Most of the reduction in mortality was due to the reduced risk in dying from colon cancer, breast cancer, and prostate cancer. Just as with the previous study, the benefit appeared in people who took 0.5 to 1.5 aspirin tablets per week for at least six years. A decrease in the risk of dying by 7-11% seems like a mighty nice benefit from such a simple treatment. 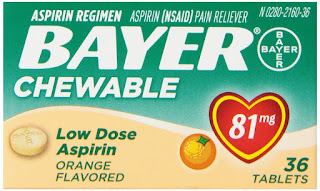 For those (like me) whose stomach is upset by aspirin, a low-dose aspirin tablet taken with food may be easier to tolerate. The low-dose pill contains 81mg, one-fourth of a standard tablet, so 2-6 of these per week is equivalent to the 0.5-1.5 tablets that provided a benefit in the latest study. It's very encouraging when the evidence for a simple, low-cost treatment consistently shows the same benefit. An important caveat is that that if you have any bleeding problems, you should consult your doctor before taking aspirin. As for me, I've already stocked up on low-dose aspirin. I'm trying the chewable ones first. the Harding Center for Risk Literacy. I learned a new word this week: pseudoepidemic. That's what happens when people start looking really hard for a disease that didn't get much attention earlier, and then–not surprisingly–the disease suddenly becomes much more prevalent. This is precisely what happened with prostate cancer in the early 1990s, just after screening tests for prostate-specific antigen (PSA) became widely available. As explained by NIH's Paul Pinsky and colleagues in an article in the New England Journal of Medicine this week, prostate cancer rates rose from 135 (cases per year, per 100,000 men) in 1988 to 220 in 1992, a 63% increase in just four years. Rates slowly dropped after that, but they remained above 150 through 2009. No one believes that this increase represented an actual increase in the rate of prostate cancer. Instead, it was an increase in the rate of diagnosis, made possible by the PSA test. After this simple blood test became available, millions of men started getting routine PSA testing. The idea was that, because prostate cancer increases the levels of PSA in the blood, this test could detect cancer early, which in turn would save lives. It hasn't worked out that way. The problem is that, as a large body of evidence has now shown, most prostate cancers are slow-growing, "indolent" tumors that don't kill you, at least not before something else does. What's worse is that the treatments for prostate cancer have very serious, life-altering side effects. 20-30% of men treated with surgery and radiation suffer from long-term incontinence, erectile dysfunction, or both. This is especially problematic given that the false-positive rate of PSA testing is as high as 80%. In other words, if your doctor tells you that your test was positive, there's an 80% chance that you don't have cancer. Many men, though, elect for further, much more invasive testing after a positive result, because who can sleep at night without knowing for certain? But how about the benefits of early detection? Alas, they did not materialize. Very large trials (including the PLCO study, with over 75,000 participants) showed that routine PSA screening did not prevent any deaths. The only study to show any benefit, ERSPC, had serious flaws, as explained by Ian Haines and George Miklos in the Journal of the National Cancer Institute. "Do not use prostate-specific antigen (PSA)-based screening for prostate cancer." "There is convincing evidence that PSA-based screening leads to substantial over-diagnosis of prostate tumors. Many tumors will not harm patients, while the risks of treatment are significant. Physicians should not offer or order PSA screening unless they are prepared to engage in shared decision making that enables an informed choice by patients." Even the American Urological Association, which strongly opposed the USPSTF recommendation when it first appeared, now recommends against PSA screening except in one age group, men 55-69 years old. The AUA, though, is highly biased in favor of testing, because its members make significant income from PSA tests and the subsequent follow-ups. "Under the `first do no harm principle,' it seems reasonable to forgo mass screening as a public health policy at this point." Someday we may have a better test for prostate cancer, but for now, we don't. If your doctor offers you a PSA test, your best response is probably to tell him no thanks.